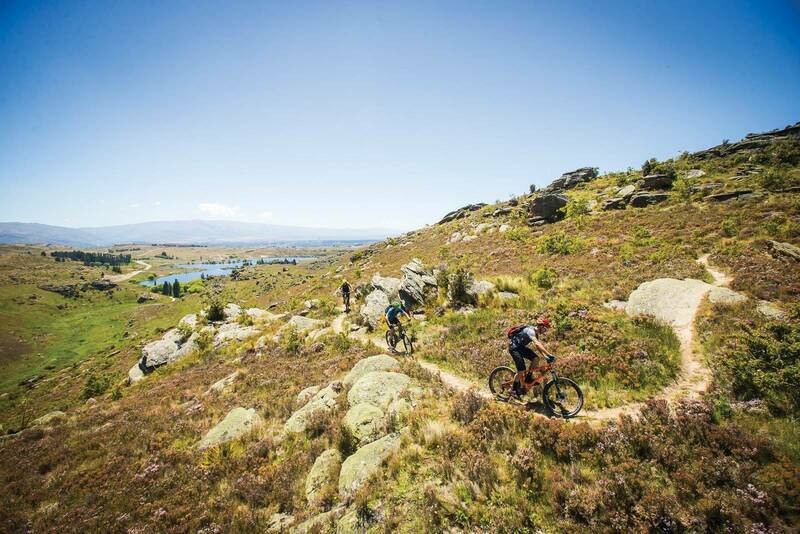 Take a trip back in thyme to discover New Zealand’s trails that were formed by the famous gold rush more than 150 years ago, but are now a real treasure for mountain bikers. The scent of thyme is close to overpowering – we have just shuttled to the top of a hill above Clyde, in Central Otago on New Zealand’s South Island. The thyme is radiating like a purple haze above the rock slabs and native flora. The wild thyme is not strictly wild, it was introduced by 19th century gold miners who wanted something to flavour their otherwise bland bread. But like so many things that have been introduced to Central Otago – it really took off. And while the gold mining brought prosperity to the region, it also brought new opportunities for what was a very poor area of New Zealand. And now, us mountain bikers get to benefit from what history has created. Old roads have been repurposed as trails, water races for gold mining have turned into mountain bike trails across the steep slopes, the old railways are used as cycle touring routes, the planted forests are riddled with technical singletrack, and some of the high leasehold farms are open for heli-dropped rides. 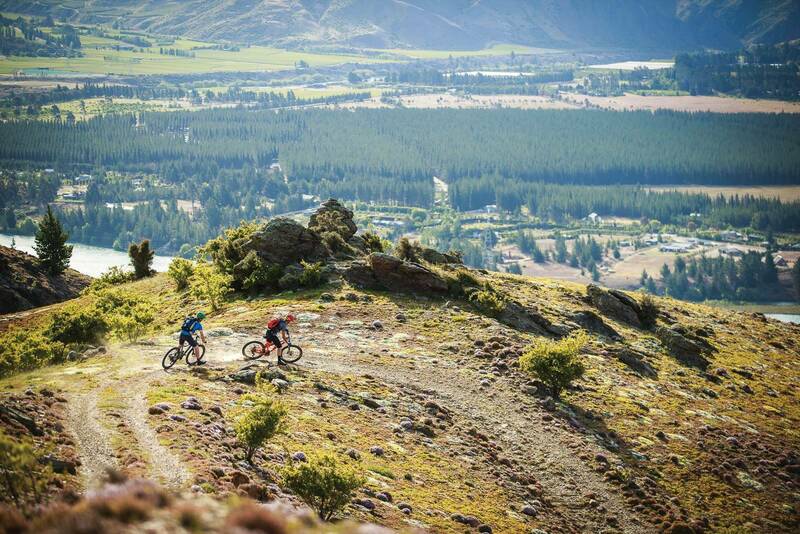 While Central Otago and its mountain bike hotspots of Cromwell, Clyde, Alexandra and Naseby might not have the names of nearby Queenstown and Wanaka – for some riders, they are likely to offer what they are missing in other locations. This trail we have just shuttled to above Clyde is actually a stage of the Linger and Die Enduro and Downhill in September, our guide Antz tells us. All of a sudden that makes me a little more cautious. It was a steep shuttle up, and the big slabs of rock are interspersed with lots of loose rock, and plenty of dry and dusty trail with some ankle to knee heigh berms - “Central Otago berms” as Antz calls them. 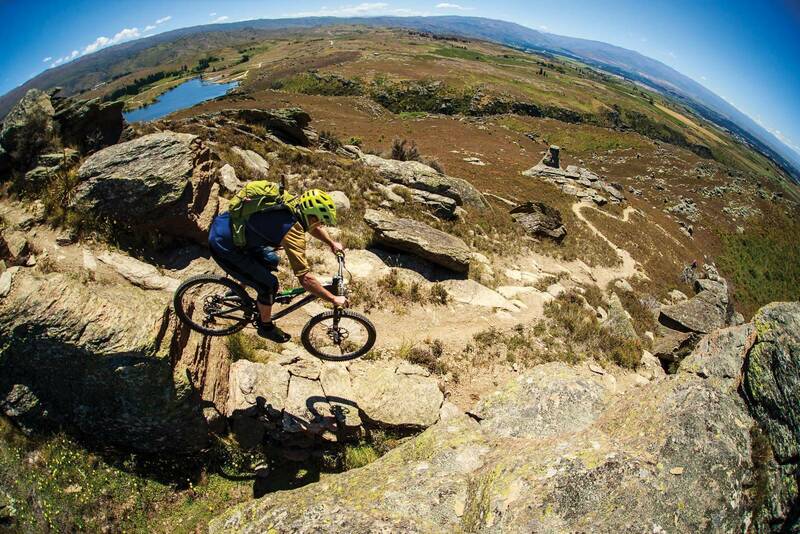 There’s not a whole lot of machine built trail in Central Otago. And that’s not a bad thing. I follow Antz down the trail, there are numerous line choices, often marked with small arrows for the more technical lines. The size of the boulders we are riding over makes the arrows a good guide, as you can’t see over them until you are totally committed. You tend to know you can roll the easier lines, but often the harder ones have a mandatory drop. The trail snakes its way down the slope, with the Clyde dam wall to our left, and the historic town below. The trail is littered with some loose rock, and the clattering sound of small debris and a bouncing chain is as prevalent in my head as the scent of time is in my nostrils. We had just arrived in Central Otago the previous afternoon. It was as simple as a flight to Queenstown, where we picked up a Subaru with bike racks from Rent-a-Dent, who are right at the airport. In about an hour we had driven to Cromwell, built our bikes and gone to the pub for dinner. 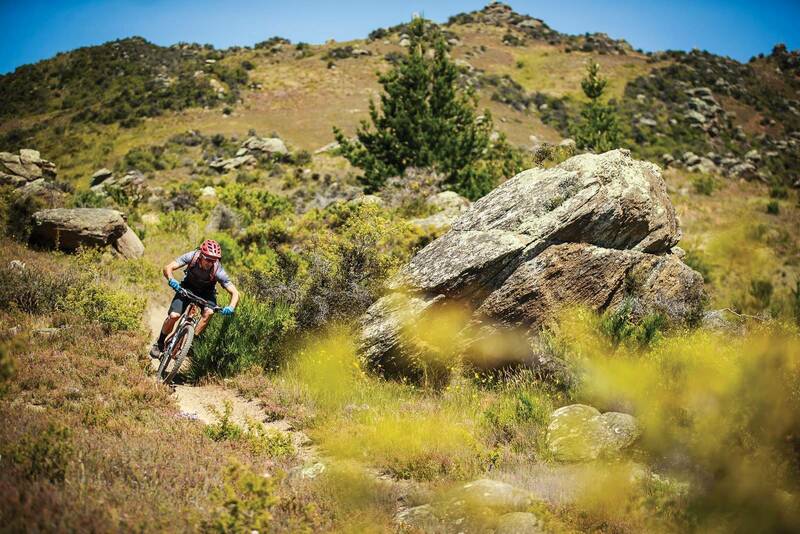 The riding in Central Otago is spread out – it isn’t focused on one set of hills, or in a bike park. And that’s part of the beauty of the area. While we would start in Cromwell, we were all set to ride the trails above Clyde and Alexandra, do a helibiking trip above Cromwell, ride the trails at Flat Top Reserve, cruise along the Clutha Gold Trail and through Roxburgh Gorge, head up high into Naseby Forest and to tour along the Otago Central Rail Trail, New Zealand’s Great Ride too. So even if the area is pulling in a big crowd, you’re not likely to be lining up for much. The biggest line we encountered all week was for a drink at Monteiths pub after an evening shop ride in Alexandra! The gold mining history is very rich in the area. The Clutha River is the highest volume and fastest moving river in New Zealand, and it is one of many rivers in the greater area that were rich in alluvial gold. Whether you’re driving, riding, walking or paddling around the region, it is easy to spot relics from the gold mining boom of the 1860s. The steep hills above the river can hide old water races, that carried water from way above to help blast away the rock. There are small huts built into the bigger rocks, and older trails that were used for access to key mining areas. Much of this was all done by hand, as people worked hard in the hope of making their fortune along the Clutha River. This hand-built nature still exists, and we visited Flat Top Hill, just out of Alexandra, to ride on the purpose built trails above Butchers Dam. This is DOC (Department of Conservation) land, so any built trails needed to be done with minimal impact – including visually. 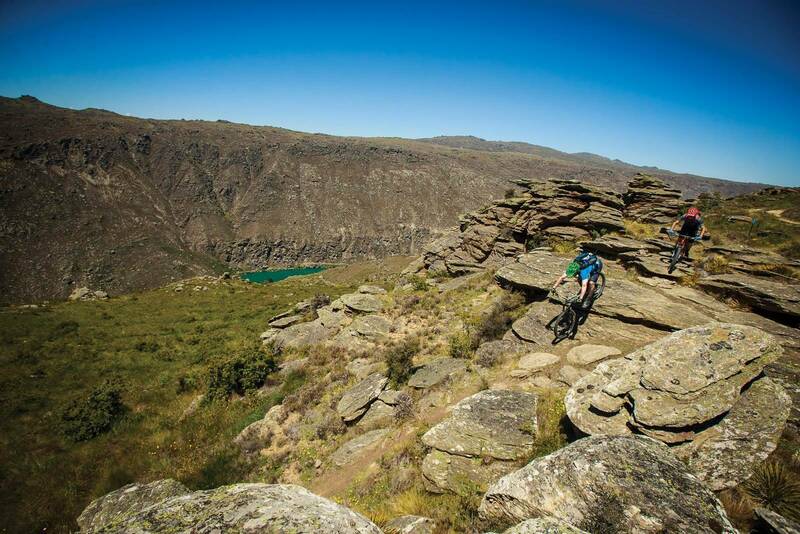 The trails are the result of hard work by the local club, the Mountain Bikers of Alexandra. You can barely see the trails from below, such is their nature. 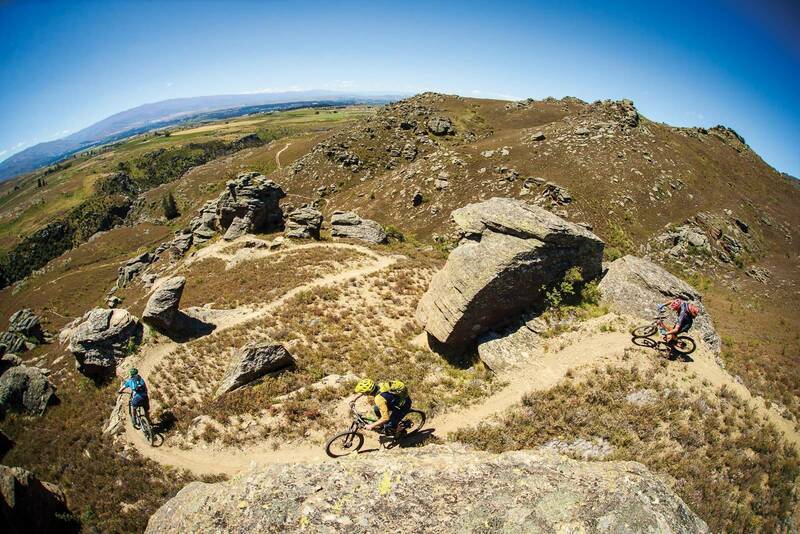 There aren’t big machine-built berms, but instead there is a tight, sinuous trail that climbs through the biggest boulders, and over the smaller ones, curving around like a long snake as it attains the ridge above the Roxburgh Gorge. Thankfully though, they do have some signposting so you can find them, and stay on them. This trail is called Purple Haze, thanks to the thyme flowers. The trails at Flat Top Hill demand attention, as the flat corners are hard to casually take at speed, and there is more than enough to catch a pedal on if you’re inattentive. If you’ve been stuck on machine-built trails for a while, you’ll love the more raw feeling of riding trails that really put the ‘single’ in singletrack. The thin brown line we followed barely scratched 30cm out of the shrubs as we followed it along. From the ridge, we take Black and Blue, a trail that skirts larger rocky outcroppings, until you’re heading into more descents with A, B and sometimes C line options marked. Like the trails above Clyde, be aware that you’re not always going to see what you’re coming into. There’s another trail off here we didn’t take, called The Rock of Doom. Maybe that’s for another time... the whole time coming down off the ridge, you look over the azure blue river as it flows past Alexandra. 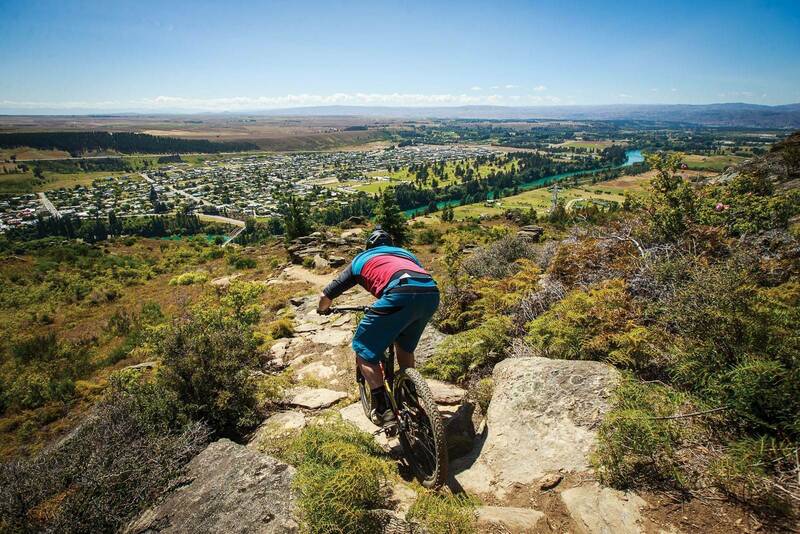 Alexandra is a little different to some of the other towns in Central Otago – it’s clear that mountain biking is a popular sport here. 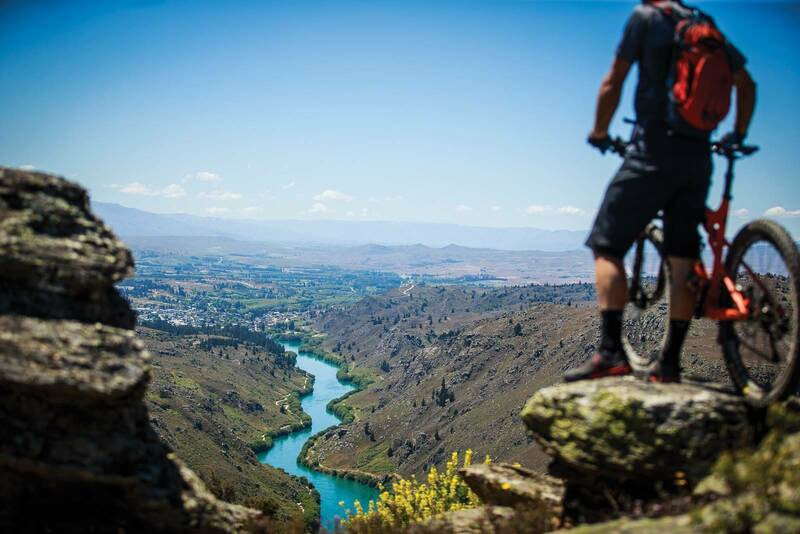 With the Roxburgh Gorge trail finishing here, and the Otago Central Rail Trail passing through, it’s certainly on the map for accessible off road riding. And Flat Top Hill is just outside of town. But the trails the local club have built above town, and the older back roads and trails beyond are worth staying for. While the trails at Flat Top Hill, and along the river, are open to the public – some of the best trails are up on a farmer’s property. The local mountain bike club have an agreement to build the trails, and run club rides on them. One of the best ways to see it all is on a guided ride. We met up with Phil from Altitude Bikes, who has permission to guide the trails – and better yet, he knows them all too, having had a hand in building many of them. Our route takes us way up into the clouds, onto the Knobbies range on the old wagon road that came over from Dunedin. We get out of the van and take our bikes off the trailer, and visibility is about 10m. We’ve driven into the clouds, but we’re about to ride out of them. The top of the hill is scattered with rock outcrops and as we descend it’s clear we are on an old road, with stone walls reinforcing the trail on the steeper sections. About halfway down, we turn into some small trails. It’s time to start concentrating a lot more. The trails here are often more technical than those on Flat Top, and the demands of the trail means we often have the dropper post slammed down, as we hang off the back, or throw the bike over larger rocks on the marked line. Trails change from following ridgelines through fragrant thyme, to following the fall line down to the creek below. Some trails have been built along the old water races, making for gradual climbs back up, and others switch back on themselves at seemingly impossible gradients, requiring intense concentration. 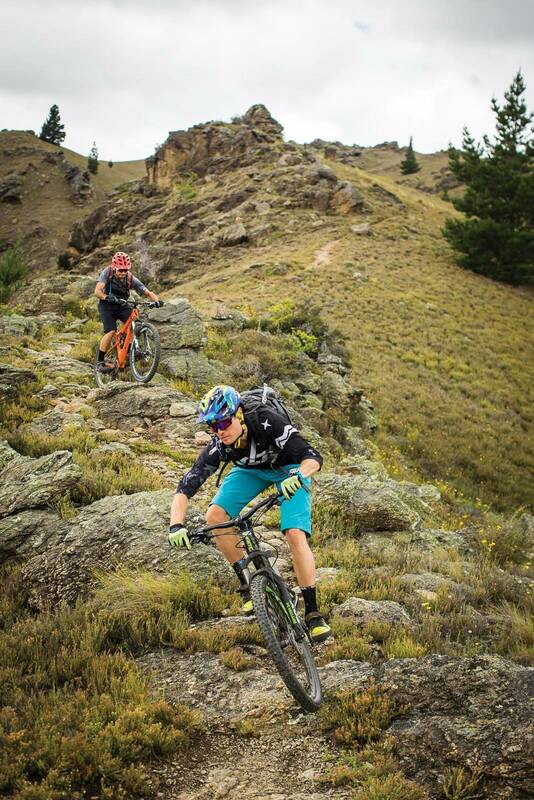 These trails make up part of the Trans NZ Enduro and the Linger and Die Enduro as well, and we all agree that they are some of the best we have ridden on the South Island. Right at the bottom of the trail, we pop out ay Shaky Bridge, a French Bistro that has opened on the edge of a small vineyard. If you like some good quality food, coffee and wine – you should drop in. While the trails we have been riding have still had plenty of altitude gain and loss to keep us entertained, we’re surrounded by bigger hills. With a visit to Heliview Flights organised, we’re lucky enough to get onto a flight that’s going up to about 1450m, to be dropped off for a long descent back into Cromwell. 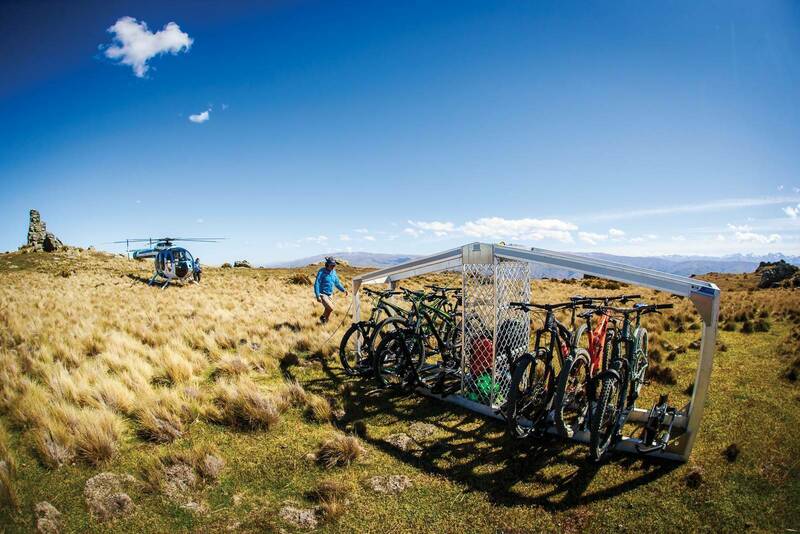 Heliview have invested in a massive cage fitted with Yakima High Roller racks, so they can take 8-12 bikes securely to a drop point. This is perfect for small to medium groups of mates, either for one of their guided rides, self-guided routes, or even to drop you off into the wilderness so you can start your wild ride home. We’ll have a full story about our afternoon up high in a coming issue. While the singletrack on the higher hills is demanding, there’s still plenty of opportunity to cruise. 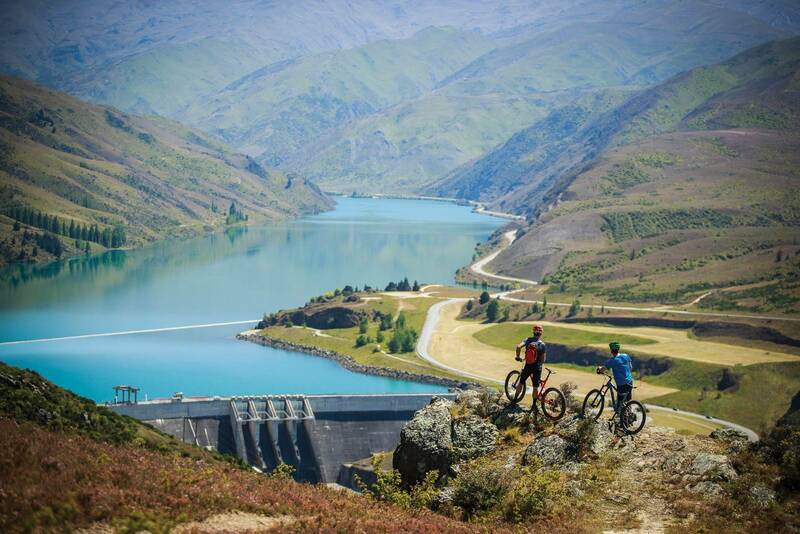 Central Otago is host to three different New Zealand Cycle Trails. The Clutha Gold trail, the Roxburgh Gorge Trail and the Otago Central Rail Trail. Each trail is unique, and they run at fairly low gradients on trails about 1.5-2m wide. You can use parts of them to get around, such as between Clyde and Alexandra – or you can pack light and try to ride the whole length in a day. This would be a pretty tough outing on the 150km rail trail. The cycle trails have some of the best views in the area, and give you the chance to slow down and unwind. The rail trail even has a pub or cafe every 15km on average, which is perfect for making sure your holiday isn’t too intense. We’ll have further features on the cycle trails in coming issues. This depends where you want to go, but we stayed at the following, who were all bike-friendly, and with self-catering options. The breakfast at Antique Lodge is perfect for a day on the trails! The Cromwell Top 10: this place has accommodation for all sorts of budgets, plus plenty of room to spread out and build or pack bikes. Roxburgh Motel: Right near town, they have a pool, comfortable beds, and free WiFi. Antique Lodge: With really comfortable accommodation in Clyde, this place has free WiFi and an awesome breakfast. Or, you could stay right at the trails, at a new bed and breakfast right on the hand-built trails above the clock on the mountain - at Brown Hare Cottage. Now. Or later. 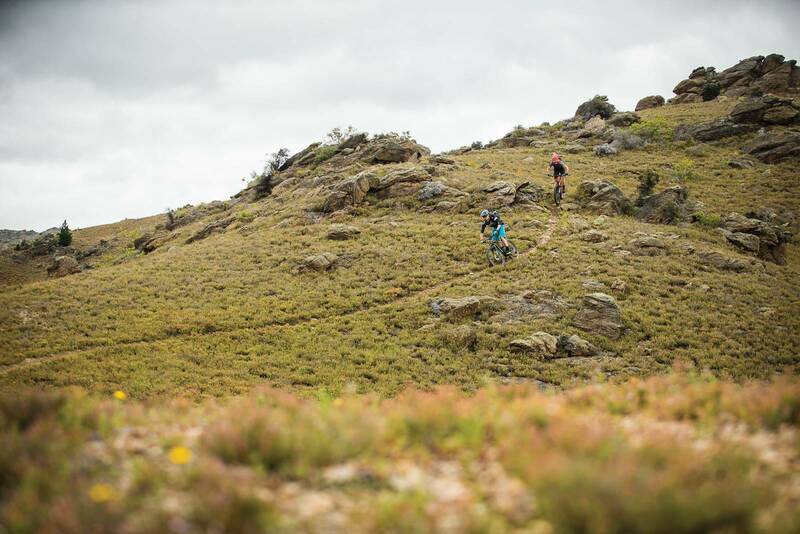 It does get pretty cold in winter, but we’re told the riding is great as it’s dry – not wet. We think the shoulder seasons to avoid the cold of winter and the heat of mid-summer would be best, but beware that spring conditions can mean snow up high, and lambing season, so there might be restrictions in some areas.